If you do not have sufficient outdoor space, having your own indoor garden is an excellent idea. It is also a boon if you live in extreme weather climes and you want to have edible or non-edible plants at your fingertips all year round. However, to achieve and obtain exemplary results, investing in appropriate indoor equipment is a necessity. This is where the Miracle-Gro AeroGarden Harvest with herb seed kit comes in. This superior NASA-tested hydroponic indoor growing system allows you to comfortably grow your own herbs, vegetables and flowers right in your kitchen all year round. AeroGrow has a few other models in AeroGardens and the Harvest is one of the newest and best selling. It accommodates more plants than the sprout model but is not too expensive for the average family. The best part about this model is its compact design, which is perfect for kitchen countertops and therefore best for growing herbs, salad greens and certain vegetables. That doesn’t mean that flowers are out of range – many varieties will grow well in it too! Amazon is where you can get the AeroGarden Harvest at a very good price. It also makes a great gift for cooking enthusiasts. Designed and constructed by AeroGrow, this state of the art hydroponics equipment uses a scientific approach to indoor gardening. The plant roots are held in air and water in the reservoir that supplies them with optimal oxygen, water and nutrients for growing. Plants grown on this system grow five times faster than in the soil. This particular model comes with a full spectrum lighting system that features LED grow lights of 20 watt energy to enhance high performance and growth. The lights are tailored to deliver daylight white for fast growth, blue for large yields and red to give you more fruit and flowers. LEDs are more energy efficient than CFLs, so you’ll get more with this unit but consume less electricity. The light canopy is set 12″ above the reservoir surface for plant growing height. In terms of size, the AeroGarden Harvest is lightweight at 6.4 pounds and fairly compact with dimensions of 11.5 x 8.2 x 13.5 inches. The unit is also made from high quality lightweight plastic that makes it effortless to set up and handle. The equipment parts also fit together flawlessly with no uneven seams, crests or gaps. The equipment’s contemporary look ensures that it perfectly blends well with most other modern kitchen appliances and the kitchen décor. Its slightly textured feel and its portability also makes it easy to place it virtually anywhere within the house, kitchen, or office. Its design makes it an excellent choice for keeping on a kitchen countertop and close at hand to pick fresh herbs or greens for a dish that you’re cooking. The absence of soil means that you have an insect-free environment. When it comes to using the AeroGarden Harvest, it becomes even easier. This is because this unit assembles quickly straight out of the box without the need of using any tools. It also comes with the whole lot of items you need to start growing immediately. These include the AeroGarden, clear domes for each pod, 3 oz. of liquid nutrient plant food, and a 6 pod gourmet herb seed kit made of soil-free pure Canadian Sphagnum Peat. The pod domes are provided to help regulate temperature and humidity for germination. They can be removed once the plants start to grow. Of course, you don’t need to use the included seed kit. You can use your own or even use part of the kit and part your own. You can also buy other seed kits made especially for Miracle-Gro that are available online at Amazon. The advantage of using Miracle-Gro pods is that they are guaranteed to grow in this environment as they are pre-seeded. The included herb kit includes Chives, Cilantro, Genovese Basil, Curly Parsley, Mint and Dill. What makes it even more fun and interesting is when it comes to planting. All you have to do is place the pre-seeded pods in your AeroGarden, add water and the liquid nutrients, turn the unit on using the easy to operate control panel and leave it to do the rest. The control panel automates everything, including when to turn which lights on and off and alerts you when it’s time to add water or nutrients. It will then deliver a balanced and accurate amount of moisture and nutrients the plants need for healthy growth. And since it is easy to program the light timer by yourself according to the type of plants you’re growing, you can use natural light during the day and engage the grow lights during the night if you prefer. Plants in the AeroGarden Harvest generally take seven to fourteen days to germinate, after which they take one or one-half months to be ready for harvesting. As the plants grow, all you have to do is adjust the height of the hood lamp. This system allows you to produce continuous harvests for up to six months non-stop. 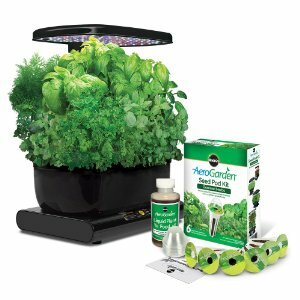 In terms of maintenance, very little is required for the AeroGarden Harvest other than replacing the grow lights. The manufacturer recommends changing the grow lights every six months. Although the bulbs can definitely stay longer, older bulbs can obstruct the efficiency of the system and result in poor yield. Plants grown in the AeroGarden Harvest are found to be fresh, tasty and nutritious. For example, lettuce grown in this unit contained close to three times more vitamin C than the typical green store lettuce. This means that the AeroGarden Harvest delivers nutritious as well as bountiful harvests. Another amazing feature of this particular unit is that you can literally grow anything you desire, from simple daisies, herbs, tomatoes, to fresh salad greens. In addition, at AeroGrow they deem their products to be as natural as they come. This means that they never use GMO seeds. In fact, most of their seeds are heirloom varieties, sourced naturally. Their liquid nutrients and vitamin-packed nutrients do not contain any pesticides, herbicides, or minerals such as iron calcium or magnesium. All AeroGarden Harvest seeds are tested for maximum flavor, color, and yield. No genetically modified seeds are used and no herbicides or pesticides either. You get a 100-percent germination guarantee. Faster and efficient growth of plants compared to outdoor soil gardens (plants grow five times faster). No fuss about pests or diseases attacking your garden. It is easy to use and maintain because all you have to do is maintain water level, add nutrients and trim the plants when they begin getting closer to the lights. You can grow whatever you want. The AeroGarden Harvest is also energy efficient and a high performer. The pods limit the number of plants that you can grow at a time. The unit does not come with a drainage cap, so you have to tilt the equipment in order to drain. This is only necessary if the water becomes dirty, however, it gets used up in a couple of days or less, so it may not be necessary. The system can sometimes prove to be too small for growing multiple bigger plants such as tomatoes that tend to grow big and gangly. The only way to raise the light hood as plants grow is to push from down. This should be done carefully. ← Which Vitamix Should I Buy for Home Use?